Located in Washington Heights, MS 322 Salome Ureña Leadership Academy (SULA) serves primarily recent immigrants from the Dominican Republic. It has a dual language Spanish-English program. Salome Ureña was a Dominican poet who opened the first center of higher education for young women in the Dominican Republic. The school faces challenges. Many students live in temporary housing and many have special needs. More than one-quarter of all students miss at least a month of school. Most students enter middle school a grade level or more behind in reading and math. Despite challenges, teachers are effective in helping boost student achievement, according to Department of Education data. The city praised the school in its report called the Quality Review, noting how skilled teachers were at adjusting lessons for English learners, and giving students clear feedback on English grammar and usage in their writing. Students get intensive instruction in reading through a program called the Middle School Quality Initiative, according to the school’s annual plan. They may also take advantage of after school support and Saturday classes. The Children’s Aide Society provides medical care, dental services and mental health support, as well as a range of after school options such as basketball, robotics, mock trial, debate team and high school-level (Regents) math. MS 322 opened in the IS 218 building in September 2005, the same year City College Academy of the Arts (a 6-12 school) was also founded in the building. 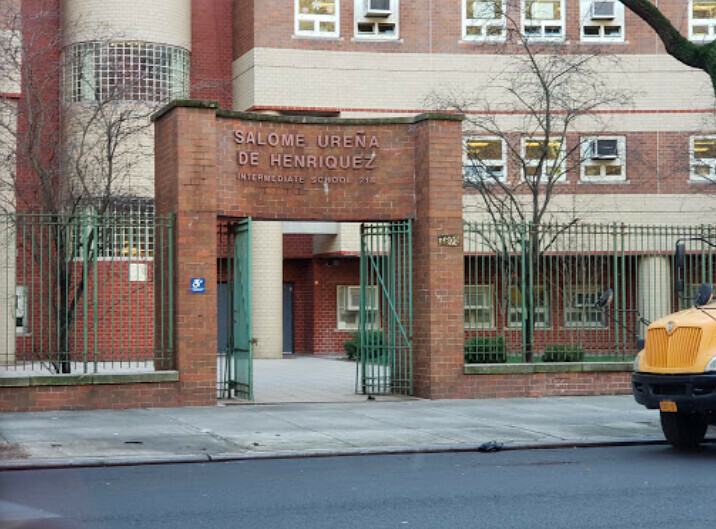 In 2018, MS 322 and IS 218 merged into one school, now known as Salome Ureña Leadership Academy, under the leadership of long-time MS 322 principal Erica Zigelman. “The merger will make it easier to share important campus facilities like the library, gymnasium, auditorium, and cafeteria,” Zigelman wrote in a letter to parents posted on the school website. More importantly, she said, the merger would open more opportunities and bring in more resources for all students.